Mom and Dad have always been there, from your first breath to your first step to your first date, and have remained your biggest cheerleaders well into adulthood. But lately, there’s been a subtle shift in the relationship, as they begin to have more needs themselves due to the effects of aging. Of course you want to be there for them; and you’re far from alone. National studies report that a little over one out of every four households (29 percent) is involved in providing care for a chronically ill, disabled or aged family member or friend. Since the population of people over 65 years is expected to increase at a 2.3 percent rate, the need for parent care solutions increases each year. Providing home care for a parent, as fulfilling as it certainly can be, can result in a major upheaval to a family’s daily life. 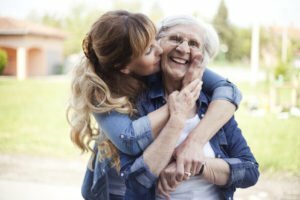 Depending on the senior’s particular needs, you may find that a large part of your day will now be devoted to your senior loved one – meaning less time for yourself and other family members. Make sure you have access to all important documents, stored in a fire-safe, secure location, including burial plot deeds, birth certificate/adoption records, marriage certificates, insurance policies and copies of the previous three years’ tax returns. For more help with senior home safety modifications, call on Hired Hands Homecare. We can perform a free in-home assessment and make recommendations to keep your parent safe and comfortable. Hired Hands Homecare in California can also help families by providing respite care, allowing relief from the daily responsibilities of caring for someone who is ill, injured or frail. This is essential for all caregivers, since caregiving depends on the caregiver’s own needs for nurture, reassurance, support and respite. Contact us at 866-940-4343 to learn more about how we can partner with you in providing the best possible care for your parents.